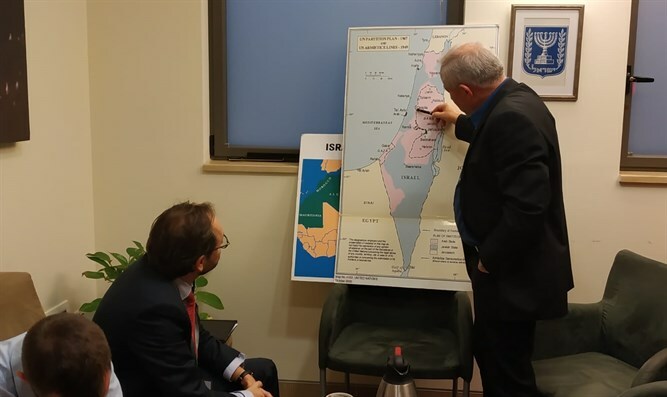 The chairman of the Knesset's Foreign Affairs and Defense Committee, MK Avi Dichter (Likud), met Wednesday with EU Ambassador to Israel Emmanuel Giaufret. The two parties discussed Israeli-European relations and the security and political changes in the region. MK Dichter said that he hopes the EU, too, will recognize Jerusalem as the capital of Israel. "We hope that as many European countries as possible will transfer their embassies to Jerusalem." "The time has come for the leaders to understand that the partition plan is no longer relevant to our time. The Arabs refused the plan and we accepted it and went out to celebrate in the streets. We did not know that we were dancing on the brink of war. All that the seven Arab countries that invaded Israel and forced us into a war for our independence wanted was to expel us from the area allocated for a Jewish state (55 percent) and to establish the Arab state in the plan on 100 percent of the land of Israel. If we are not strong enough in this area, we will not survive,” Dichter emphasized.